This (Instant Pot) Pressure Cooker Stuffed Green Pepper Casserole has all the flavors of stuffed green peppers in an easy-to-make casserole. 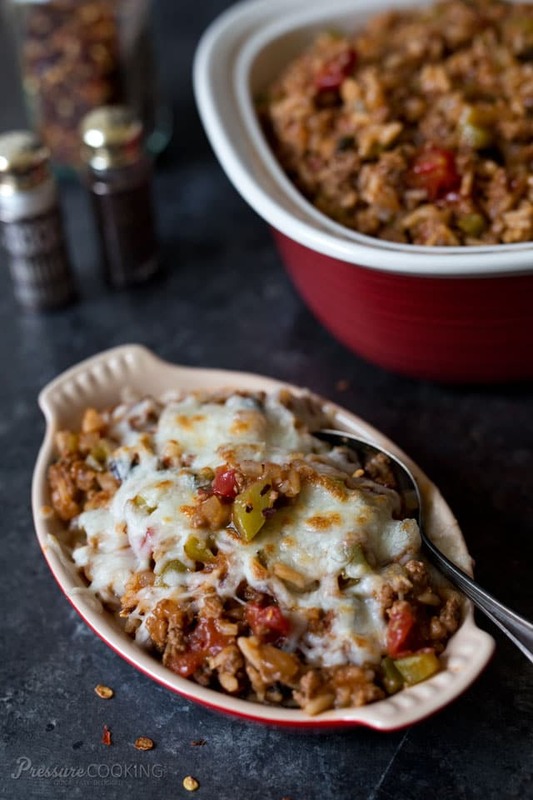 If you love stuffed green peppers, you’re going to love this Insta Pot casserole. I’ve made so many sweet online friends because of Pressure Cooking Today. One of them is Genene Abraham. 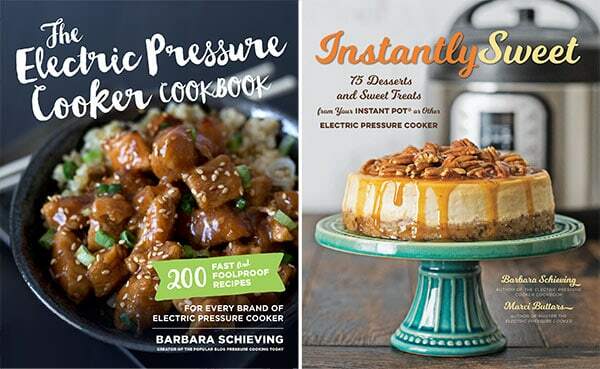 Genene shares my passion for pressure cooking, and she often shares recipes with me that she thinks would make great pressure cooker recipes. Genene found a Stuffed Pepper Casserole recipe on Brooklyn Farm Girl and thought it would be easy to change into a pressure cooker recipe. She asked me if I thought there was enough liquid in the original recipe to pressure cook it, and what I thought the cook time should be. Since there was only 1/2 cup rice in the recipe we agreed that there probably was enough liquid. I suggested a 4 minute cook time since white rice cooks quickly. Genene tested the recipe and her and her husband fell in love with it. After her rave review, I decided I needed to make it and share it with you. I’m glad I did. 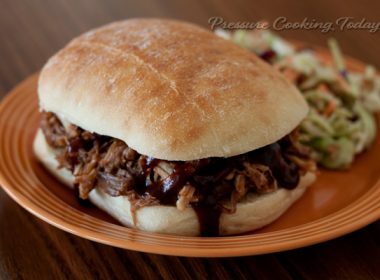 It’s hearty, flavorful and quick and easy. A perfect weeknight meal for the cold winter months ahead. I hope you’ll give it a try too. An Instant Pot is one of the most popular brands of electric pressure cookers. 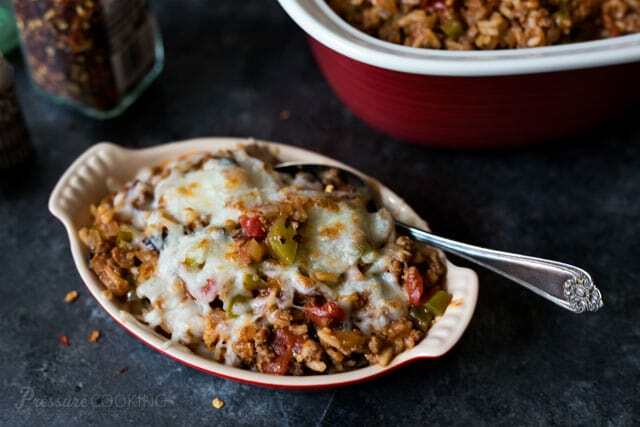 They are easy to use and your Instant Pot can help you create this Pressure Cooker Stuffed Green Pepper Casserole! Preheat the pressure cooking pot on the Browning/Sauté setting. Add the ground beef and onion and cook until beef is browned and crumbled. Add garlic and sauté 1 minute more. Stir in green peppers, spinach, tomatoes, tomato sauce, beef broth, rice, Worcestershire sauce, salt, and pepper. Lock lid in place, select High Pressure and 4 minutes cook time. When timer beeps, do a natural release for 10 minutes, then release any remaining pressure with a quick pressure release. Turn off pressure cooker and pour casserole into an oven-safe baking dish. Sprinkle the cheese on top of casserole and broil until the cheese is melted and starting to brown. I also got the burn notice 3 times before I gave up. The first two times, I scraped the bottom and added more broth. By the time I got the third notice, the rice was pretty much cooked so I just stopped. There was very little rice, so I cooked up an extra cup of rice in my rice cooker, and threw in even more I had left over in the fridge. 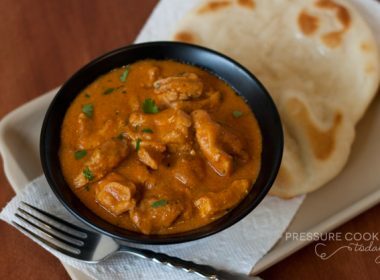 In the end, we really enjoyed it, but we might use the original method of cooking this, because it really didn’t work for us in the Instant Pot. Tried it again because I loved the final product so much! This time we tripled the rice and broth, and did as someone else suggested and didn’t stir in the ingredients. We just layered everything on top of the beef and then finished it off with the tomato and tomato sauce at the very top. No burn notice and it turned out great! Thanks for sharing your tips Ruth! Glad it was a success. Thanks for the tip Patti – deglazing is so important. I made this today and it was yummy but it seemed a bit “soupy” so I added a small slurry to thicken it a bit. Did use stewed tomatoes (what I had) instead of plain diced tomatoes. Think it added a bit more flavor. Unfortunately, I can’t eat green peppers so I used red ones. I used everything else per the recipe. According to my DH, the casserole didn’t have as much pepper flavor as regular stuffed peppers but he still liked it. Wondering how to add more pepper flavor and not have it come out so soupy. Any suggestions? Thanks. Hi Suzanne – what type of rice did you use? Was the rice fully cooked? For a stronger pepper flavor, you can double the peppers. If you used long grain rice and it was fully cooked, next time you could try adding more rice. Hi Barbara, I did use long grain rice but it was Uncle Ben’s. However, it was cooked perfectly. I think I’ll add a bit more rice as you suggest and more peppers too. Do I have to increase the time for more rice? Thanks for replying. Thanks for the additional information. Uncle Ben’s is converted rice. Rice that has been parboiled and dried. It may not absorb as much liquid as regular long grain white rice. So if you do add more rice, be sure you’re using Uncle Ben’s again. I made this and it’s delicious. The only problem is the rice is still hard. I recommend making the rice in pot of water and then adding the rice to the food when it’s done. Glad you enjoyed it. No need to make the rice pot in pot. If you have a good seal the rice will get tender. If it isn’t as tender as you’d like, use the Saute function to simmer the rice a little longer until it is tender. You may need to add a little water as it sautes. I was nervous to try as I read a lot of people got the burn notice. I followed the recipe exactly, except for the mixing step. I added the tomatoes and tomato sauce last, and just left them sitting on top without mixing into the other ingredients. Not sure if that was the trick or not lol will definitely make this again! Thanks Rebecca – glad it was a hit! Serves 6 but how much is 1 serving? 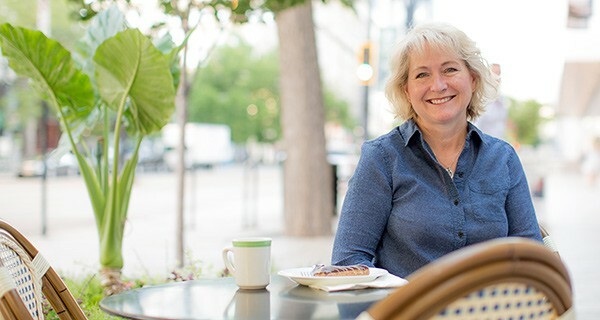 Hi Lisa – typically I consider 1 1/2 cups a serving. I love this recipe, one of my favorites. However my IP has given me a “burn” notice each time I’ve cooked it. I get around it by releasing pressure, stirring, then starting again, letting it natural release the 2nd time. Love it enough to keep trying. What am I missing? I scrap the pot removing hamburger bits, one time I even cooked the hamburger in a seperate pan. Any Ideas? Love your cookbook too, thanks for great, easy meals. Hi Sharon – if you’re sure you have a good seal, you may just need to add a little extra liquid. So nice to hear you love the recipe. This recipe is awesome but is it supposed to be so liquidy/runny? Hi Michael – no the rice should absorb most of the liquid. Was your rice done? 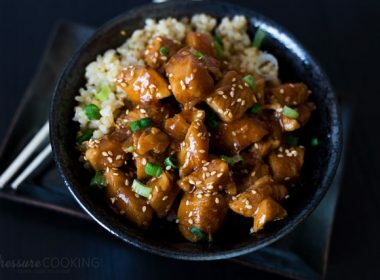 This recipe completely sold me on my boyfriend’s Instant Pot!!! I add red pepper flakes in with the garlic and also add a bell pepper and usually more onion. I’ve also found that I can add more rice as long as I match it with stock. One of the first times I made this, I bought a whole chuck steak and cubed it really small (our grocery store was out of ground meat before a snowstorm.) It worked perfectly and is actually the way I usually make it now!! Thank you for a super versatile, awesome recipe! Thanks for sharing your tips Katie – glad you enjoy the recipe. Using cubed chuck steak sounds delicious! This country boy made this tonight and owee it was good. low sodium tomato juice. Turned out great. Low fat, low sodium and great taste. Love love this recipe, so much easier than stuffing peppers. First time I made it my nephew ate half the pot and went back for more. Mashed potatoes on the side and I’m in 7th heaven. I’ve made it 4 times now with on problem in my 6qt UP, since it’s just me now I’m going to make it in my new 3qt and I assume the time will be the same. Do you drain the grease after cooking the beef? No, but if your beef isn’t lean then you could. 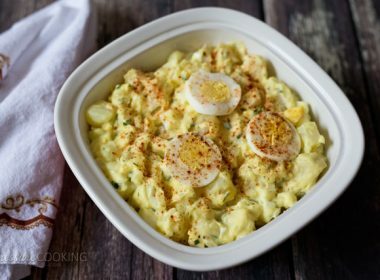 How would I go about doubling this recipe? I need to feed a family of 8! Thank you so much, i think my family is going to love it! Hi Kari – you double all the ingredients, but keep the same cook time. If you have an 8 quart pressure cooker, you won’t have any problem doubling it. If you have a 6 quart, make sure you don’t fill it more than 2/3’s full. Enjoy! Hi Katheryn – no, you don’t increase the time when doubling a recipe unless the meat is twice as thick. Be sure you don’t fill your pot more than 2/3’s full. Enjoy! Please find a way to convert this French Apple Cake recipe so that it can be finished in a pressure cooker. It should fit into a 7 inch diameter pan. Thanks. I took it from Facebook. Preheat oven to 180 degree C. First prepare a 18 cm cake pan by oiling it well and dusting it with flour..
Take flour, baking powder, salt in a bowl and mix well. Set aside. Take butter, sugar, vanilla in a bowl and use a beater to whip till it gets creamy. Add one egg at a time and beat till cream. Add in rum and flour mix. Beat till mixed. Add in the chopped apples and fold gently. Spoon this into the pan and smooth the top. Sprinkle with the 2 tblspn of sugar and bake for 40 mins untill a toothpick inserted comes clean and top is golden. Remove it from pan and slice and serve. Hi Ann – my guess is your cook time in the pressure cooker would be 30 minutes covered with foil. Check it with an instant read thermometer. You want an internal temperature of about 210 degrees. Let me know how it goes. My husband in on a very low sodium heart diet. I modified this receipe for us. I used no salt added tomatoes and sauce. Used 1/4 tsp of lemon juice in place of salt, no sodium beef broth and Swiss cheese instead of mozzarella and 93% lean ground beef. It was so good, this is definitely a keeper thank you. ? Thanks for sharing your changes Heather! Glad you enjoyed it! I have organic short grain brown rice. Any idea if that requires longer cooking time than long grain rice? Thanks. Hi Dawn – I typically cook brown rice for 22 minutes which is probably too long for the veggies. You could stir in the pepper and spinach after pressure cooking for 22 minutes and just simmer on the saute setting until they’re as tender as you’d like. 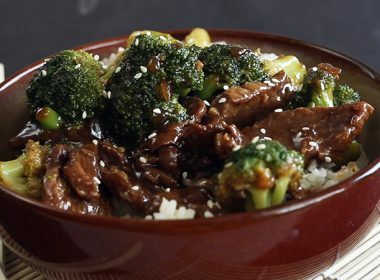 You’ll need to add extra beef broth for brown rice – I’d use 1 cup. Let me know how it goes. We made this the other night and it was very yummy. But I had to stop the cycle the 1st time and end early the 2nd time because it said burn on the display. So about 1/2 way through when we started it said burn, so i turned it off, let it vent and checked it. No burning, smelled great but rice wasn’t quite ready. So I stirred it and started the cycle again. At about the same point it said burn again, so I stopped it again. This time the rice was done but the bottom of the pan had a burned layer. It was still yummy and we finished the rest of the recipe. Any suggestions on the “burn” part? Hi Barbara – sorry you had trouble with the recipe. Often when the liquid cooks off too quickly, it’s because you don’t have a good seal and too much liquid is lost. If this should happen again, I would recommend adding additional liquid and finishing the dish on the saute setting, just simmering it until the rice is as tender as you’d like. This needs to be tweaked. I got that burn msg and a burned layer as well and there was still plenty of liquid. If this many of us are taking the time to comment about this I guarantee many more are and will have the same issue. What size pressure cooker were you using? I had the exact same thing happen to me. It happened to me as well, and I had added an extra 1/2 cup of liquid at start. Strange as I’ve never had a ‘burn’ warning before, and there seemed to be plenty of liquid in the pot. I had used Better Than Bouillon for my broth — not sure if the solids from that had anything to do with it. I ended up finishing on sauté, adding more liquid as needed. Tasted great! I haven’t made this yet, but I’m definitely going to. I’m fairly new to the IP, but I’ve gotten the burn warning with other recipes with similarities. I’ve discovered that if you have tomato products, you shouldn’t mix everything together, just pour the tomatoes on top. For some reason, tomatoes will frequently cause the “burn”. Yes – you could make it without the rice or substitute quinoa. I haven’t tried it with quinoa, so let me know how it goes. Thank you – I will! I was thinking cooked lentils might work too, but will probably try with quinoa first. Hope to make this next week. Made this tonight and everyone loved it. My kids had thirds! I used quinoa and it was yummy (nice crunch). Also left out the beef broth. Thanks for the great recipe!